My birthday month sale continues!! use code Bday20 on orders over $100 to get 20% off. Orders over $125 get 20% off with the above code PLUS free shipping (no code needed). Please note that the sale is only on currently in stock items only--custom orders are not included. I've got lots of new colors this week! The first one is Anatidae. It's a complex striper, with 10 rows forest green, 3 rows black, 3 rows bright yellow, 3 rows black. Anatidae is the scientific genus that includes ducks. These are birds that are adapted through evolution for swimming, floating on the water surface, and in some cases diving in at least shallow water. 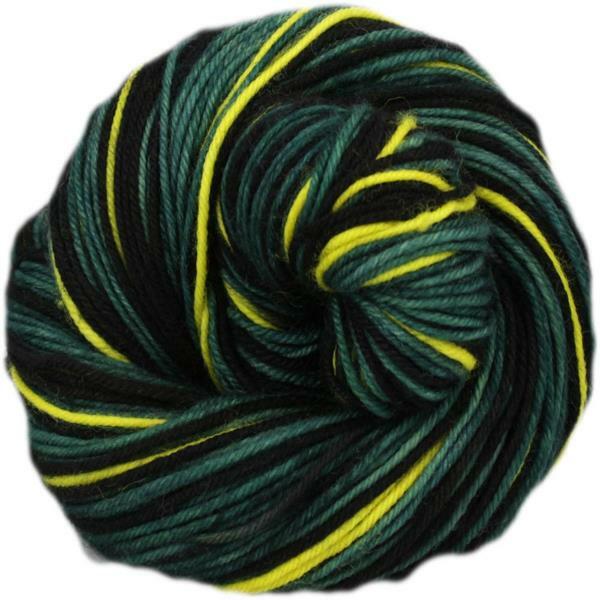 My second new colorway this week is an S.E.U. S.E.Us are my name for my one off colorways that won't be repeated. This SEU is a complex striper with 7 rows orange, 3 rows white, 7 rows black, 3 rows white. 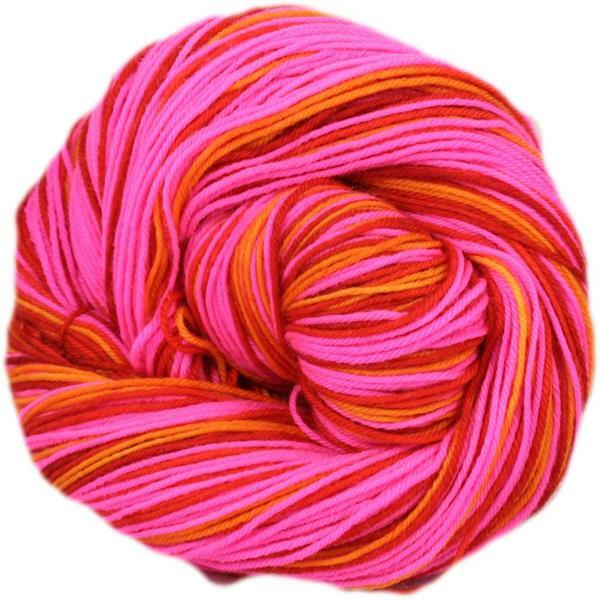 My 3rd new colorway this week is Zinnia. Zinnia is another complex striper with 10 rows fuchsia, 3 rows scarlet, 3 rows orange, and 3 rows scarlet. I only have 3 skeins of this in the shop this week--but if you'd like to custom order it don't hesitate to drop me an email! Zinnia is a genus of plants of the sunflower tribe within the daisy family. I've also had time to photograph and upload all the rest of the reskeined yarns from my trunk show--which includes all the rest of my DK and Worsted weight skeins I had undyed. Once all of these are sold, the DK and Worsted will be moved to the "order by the bag" grouping of bases. Custom orders remain open--however, next week I will mostly be working on the August sock club, so any orders placed will be bumped back a bit until I finish working on that. I've been anxiously awaiting the release of this pattern, and it's finally out! Typhoon is a shawl pattern written specifically for use with a self striping paired with a complimentary and coordinating skein of solid. I already have plans for at least 5 of them. 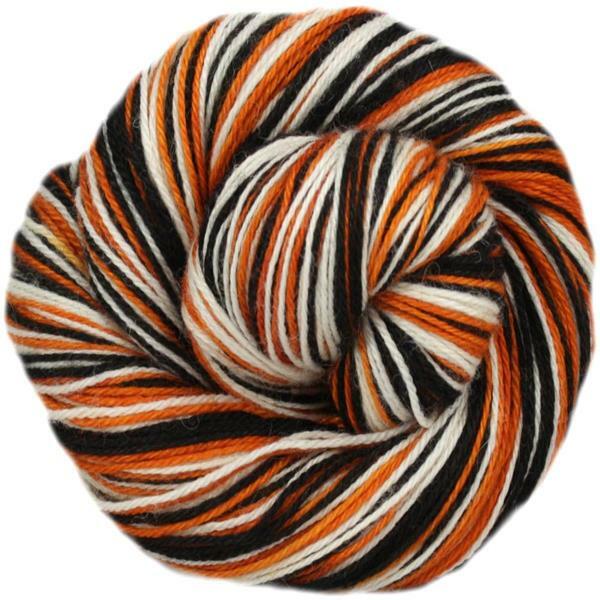 Strut is a fantastic new sock pattern also designed for self striping. Bonus, the designer is releasing an ebook of patterns for self striping, and if you buy the ebook now you get all the patterns for a mere $7.